I first met the woman who is now my wife in 1998 in Rancho Bernardo, in San Diego County. We were both attending traffic school for our speeding tickets. I guess you can say our relationship was written in the citations. Shortly after we met, I decided to surprise her at work. I knew she worked as a cashier for Hussar’s Jewelry (now closed) in some place called Sun City for her friend Alan Kleinberg. I called Alan and got the directions. As I was driving, and driving, and driving, I found myself wondering, who would want to live all the way out here? Fourteen years later, I have the answer … me. Especially since the area has grown so much since then. 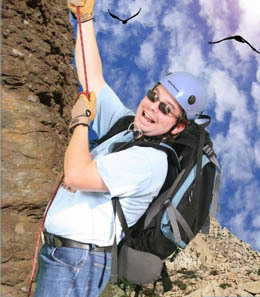 We moved to Menifee in early 2010 because my work had transferred me to the Temecula office at the time. Since then, I have changed jobs and make that long commute to San Diego every day, but I don’t mind. I think it is worth it. One thing I wish I had known our first summer here was all the things there are to do in Menifee during the summer, and when they tend to happen. It always seemed that I found out the day of the event or afterwards. So for readers who may be experiencing their first family summer and want to know what to plan for in Menifee, here are a few events to look out for, some with more details to come. This coming Monday, Memorial Day May 27, the City of Menifee will host a Memorial Day Ceremony and Picnic at Wheatfield Park. The ceremony will be from 11 a.m. to noon, and the picnic will be from noon to 4 p.m. Click here for more information. For several years now, the M.A.R.S. 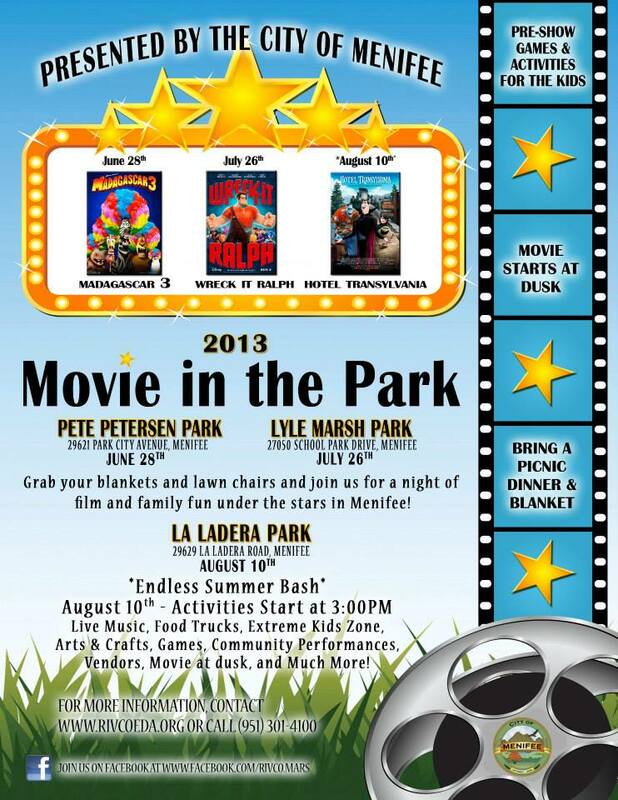 program has put on a Father’s Day Campout at La Ladera Park. I have not gotten confirmation on it yet, but as soon as I do, you can bet I’ll tell you more. In addition to this, they also do “Movies at the Park”. There are three throughout the summer and they just announced the dates and times this week (see attached flier). 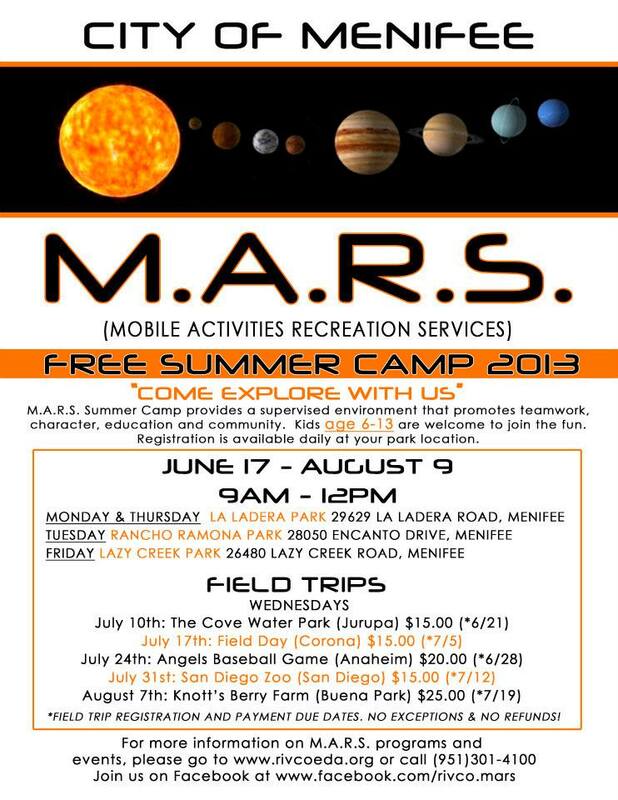 On top of that, there are Free Day Camps for the kids at the local parks (see attached flier). One other important note is that traditionally, the City of Menifee does its Independence Day celebration the Saturday before the Fourth of July. This is important for two reasons: Planning your time, and pet safety. As any responsible dog owner will tell you, fireworks drive dogs nuts and many dogs have jumped fences to either run away from or toward the sound. Please make sure your dogs are safe and sound, locked up in their dog run, or inside, wherever you consider safe. If you have anything to add or a suggestion for a future column you can reach me on Facebook, Twitter, or Email.